It’s snackage time, and who doesn’t love some chili cheese fries? Homemade chili would be awesome, but if you don’t have time or patience like me (most often), I really like the stuff Better Bean Company makes. Their chili has red and black beans, and despite all the different kinds of peppers they use, the spicy is on the mild side. Best yet, this bowl is vegan, gluten-free, soy-free, and GMO-free. Bake fries at 400 degrees for 15 minutes using spray on olive oil. Trader Joe’s has some great olive oil spray. Spritzing the fries with olive oil spray makes them crunchy without loading on all the fat like regular frying would do. To melt the cheese, put your fries in the bowl first, then layer with chili, and sprinkle on the shredded Cheddar. Put in the microwave for like 30 seconds or enough time for the cheese to melt. Then, add on the onions and tomato. Stephanie Quilao is a food blogger and author. You might know her as @skinnyjeans on Twitter. 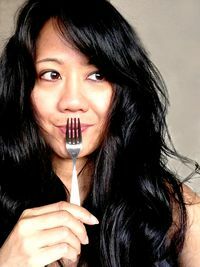 Visit her at www.noshtopia.com for a fun world of healthier eating where Stephanie eats flexitarian and combines her love of food, art, and tech.